This workshop highlighted city and county examples sharing proactive approaches to substandard and dilapidated properties. The program featured a presentation by the UMVRDC, a panel of speakers sharing local examples, and a round robin attendee discussion. Participants walked away with strategies that could work in their community. Check out the presentations and examples shared that day! Chad Kingstrom was hired as a Community Development Specialist to focus on transportation in March 2019. As a native of Sacred Heart in Renville County, he is excited to work with communities in western Minnesota in a new role. He served on the Sacred Heart City Council from 2010 to 2015 and the Renville County EDA Board of Directors from 2010 to 2014. He has a Bachelor of Arts degree in Philosophy from Southwest Minnesota State University and upon completion of his thesis, focusing on Southwestern Minnesota, he will have a Master of Urban and Regional Planning degree from Virginia Commonwealth University’s L. Douglas Wilder School of Government and Public Affairs. His working background is in agriculture where he has worked in the nursery industry, corn, soybean, and sugar beet production, as well as organic vegetable production, both locally and in Virginia. He has been living in rural Virginia near Richmond with his wife and preschool age daughter. He loves growing food, family reunions, and lending a hand or bending an ear to farmer and artist friends. He’s looking forward to getting back to walking in the Upper Sioux State Park along the Minnesota River. Welcome, Chad! The UMVRDC’s RLF Board would like to welcome Commissioner Ben Bothun, who will be representing Lac qui Parle County. As a newly elected commissioner, Ben is involved with the Madison Kiwanis and is a Knights of Columbus member. Ben, along with his wife and two children live in Dawson where he was born and raised. After spending 13 years in the Twin Cities area he moved back to the area in 2017 where he currently works for United Prairie Bank in Madison as an Insurance Agent. The UMVRDC’s RLF Board would also like to welcome Commissioner Erick Klepel, representing Big Stone County. Erick, his wife, and four children live in the Odessa area where they farm. Erick is involved with the Big Stone Area Growth organization as well as the UMN Extension. The UMVRDC’s RLF advisory board consists of thirteen members appointed from each of the five counties, regional economic development professionals, and representation from the UMVRDC’s board of commissioners. There are currently gap funds available for new or expanding businesses throughout the region to apply for. Help support the Byway strengthen communities in the Minnesota River Valley. By promoting the river valley’s exceptional historical, scenic, cultural, and recreational opportunities, the Byway boosts economic development in communities along the Minnesota River—from Browns Valley to Belle Plaine. The Byway Alliance is made up of cities, counties, historical societies, tourism entities, DNR, MnDOT, Tribal communities, and citizens along the 287-mile stretch of the Minnesota River. Some projects the membership would help aid this year include website updates, visitors guide, and other various marketing. More membership dollars mean more advertising of this unique landmark that holds such great natural and historical significance in the area. Montevideo Arts Project (MAP) committee has contracted with the UMVRDC to complete the overall coordination, survey, and implementation of a public art staircase mural. The theme of the staircase, which is located between Kluver Law and Christa Landmark Boutique in Montevideo, will be the Minnesota River. Local youth and community members will be encouraged to identify plants and animals that live in the Minnesota River and create artwork to be incorporated into the mural. Victoria Fortenberry-Jones has been hired as the artist, an art educator from the Minneapolis area who has ties to Montevideo. MAP and the city will also complete landscape work along the steps for an overall beautiful transformation of the space. The UMVRDC will work with city staff and city chamber staff who will both put in-kind hours towards the project. The timeline is to have the staircase mural completed during the summer of 2019. 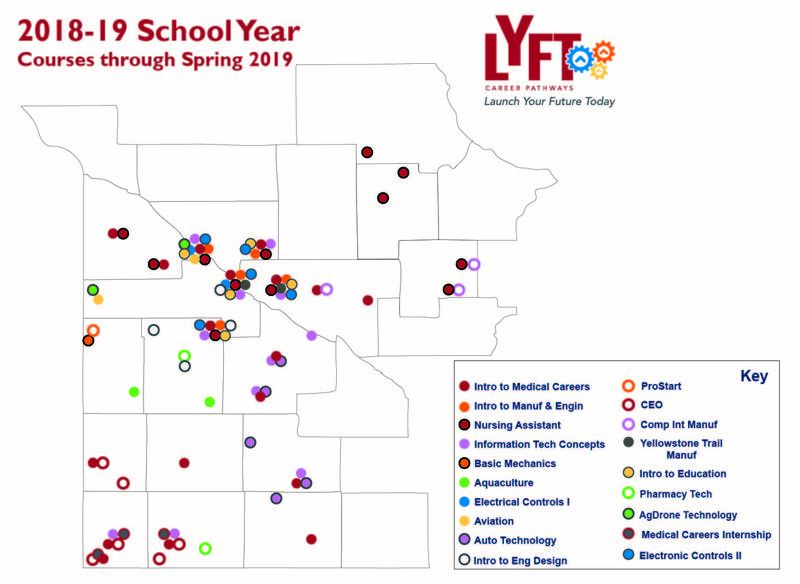 The LYFT (Launch Your Future Today) program is organized by the SWWC Service Coop and provides funding to local partnerships to jump start career and technical education (CTE) projects. Several schools in our region are implementing LYFT projects and several other partnerships are currently in discussion. Check out the map to see where courses are being taken for the 2018-19 school year. The workshop included presentations on CTE collaboration in healthcare, manufacturing, and transportation. CTE is critical in helping students see themselves in the types of careers that are available in our rural communities. LYFT partners are working to help businesses, high schools, and colleges collaborate on shared opportunities for students to gain exposure and the skills they need to meet our regional labor market demands. The Explore Minnesota Tourism Conference was held in February in St. Paul, MN. UMVRDC staff attended and learned about the coming year’s biggest challenges for Minnesota tourism, new marketing trends, and industry accomplishments from the past year. Keynote speakers covered topics from giving travelers what they really want, to optimizing your brand, and becoming quick-change artists in a constantly changing industry. Breakout sessions and networking opportunities provided time for more interactive learning and skill building. A highlight of the conference included the rollout of the new True North campaign, which not only highlights the hidden gems and popular attractions in Minnesota, but the emotional qualities of travel and human connections. We have already started to apply strategies and ideas learned at the conference to enhance marketing for the Prairie Waters tourism program.